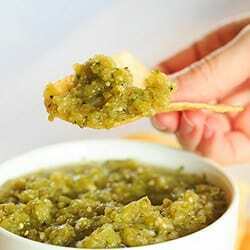 A traditional salsa verde recipe with tomatillos and an extra little punch from seasonal Hatch chiles. It took me an embarrassingly long time to come around on green salsa. I could never see past the fact that it’s… green. Very short-sighted of me, of course. So, what turned the tide? A trip to Chipotle. 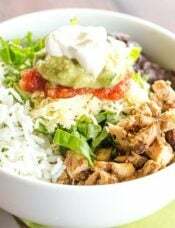 As anyone who has been to Chipotle knows, they have a mild fresh tomato salsa, a medium-hot salsa verde and a hot red tomatillo salsa (as well as a corn salsa). The mild salsa has chunks of tomato, which I don’t particularly care for, and I can’t handle the hot-hot stuff, so I settled on the medium salsa verde on my first trip to Chipotle. Much to my surprise, I loved it! This past Sunday, I bucked the Italian food trend for Sunday dinner and had a taco bar instead. Since I had Hatch chiles I wanted to use, I decided to include a salsa verde along with traditional salsa for the spread. 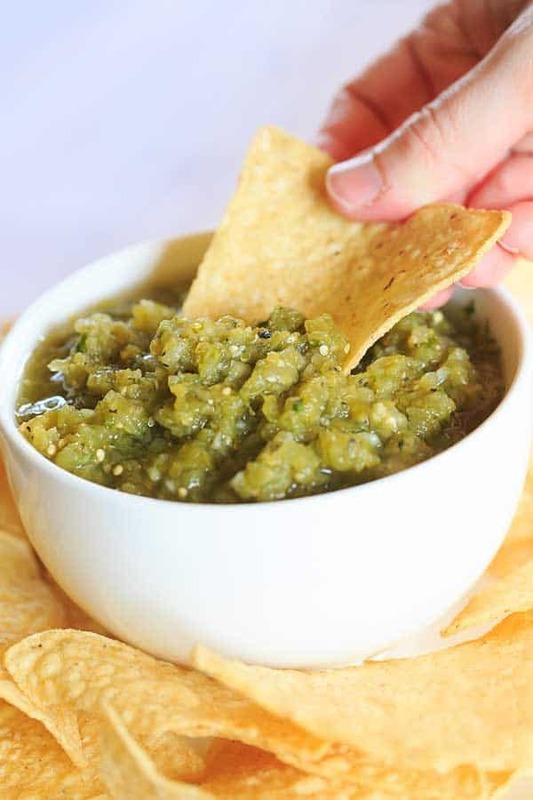 There are a couple of different variations you can use for making this salsa – if you don’t want to use fresh tomatillos, you can substitute canned (drained) tomatillos, which eliminates the first step in the recipe (and saves some time!). 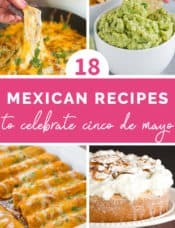 I was dying to use more Hatch chiles since we loved the mac and cheese that I made last week so much, so in keeping with the green theme, I added them to this recipe. 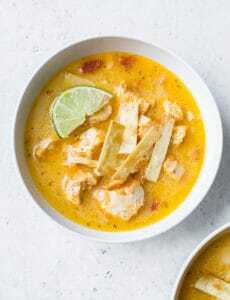 Like Chipotle, I would give this recipe a medium to medium-hot rating on the spiciness scale. You could certainly scale back on the Hatch chiles to lessen the punch, and if Hatch chiles aren’t in season, you can use 1 or 2 jalapeños (seeded) instead. It took way too long, but I’m so glad to have salsa verde in my dip repertoire! 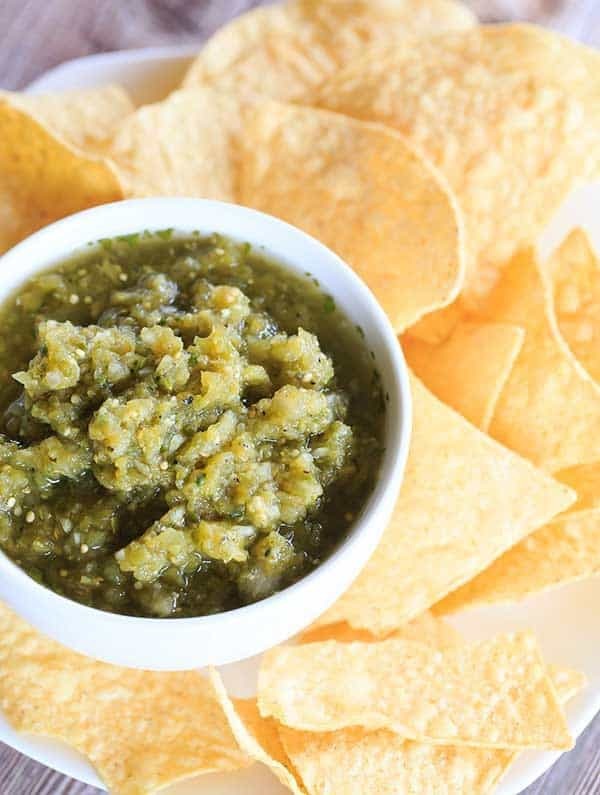 A traditional salsa verde recipe with an extra little punch from seasonal Hatch chiles. If you cannot get Hatch chiles, you can substitute 1 or 2 jalapeño peppers (seeded) to give the salsa some heat, if desired. Place the tomatillos in a medium saucepan, cover with water and bring to a boil over high heat. Boil until they turn brownish-green and are soft, 5 to 7 minutes. Remove with a slotted spoon and immediately place into a bowl of ice water. Place the drained tomatillos, Hatch chiles, cilantro, onion, garlic, lime juice, salt and cumin in a blender and puree until smooth. 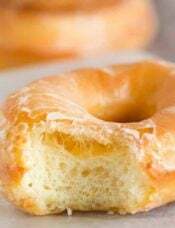 Place in an airtight container and refrigerate for at least 1 hour before serving. The salsa can be refrigerated for up to 4 days. We just moved from Ohio to Arizona and there is an abundance of hatch chiles here. I made your Verde and the Hatch Chile Macaroni and Cheese. Both were delicious! Thanks for sharing! Hi! 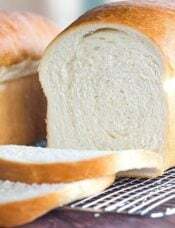 I use your recipes frequently (your cinnamon roll biscuits are a favorite!) but don’t often comment. I’m from New Mexico, and we put Hatch chiles on EVERYTHING! I’m telling you, you HAVE to try chipped and roasted green chiles on a cheeseburger or pizza! I never eat pizza without it! I also know people who put chiles in their mashed potatoes! All that to say…your salsa and your mac and cheese with green chiles look divine! 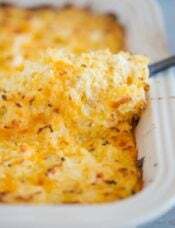 I’m printing off the mac and cheese recipe to try! Coby, I spent my formative years in Las Cruces, which isn’t far from Hatch. I have to say living in the Midwest for the past 40+ leaves me Hatch chile deprived. One of my fave dishes is chile con queso, a great dip and enchilada filling (stacked like pancakes with a fried egg on top… sheer heaven)- the hotter the better. One of the upscale markets here recently brought in Hatch chile but it wasn’t in great shape. 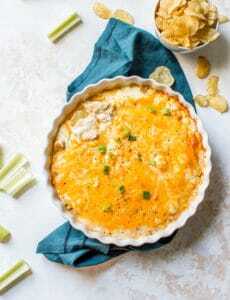 Don’t know if this will help, but if you are having trouble finding Hatch chiles, but you come across Anaheim or California chiles, they will absolutely work for any recipe calling for Hatch chiles. They are virtually the same chile, with the only distinct difference being that Hatch chiles are grown in the chile capital of the world, Hatch, NM. Some people claim that Hatch chiles are hotter, but I’m here to tell you that ALL chiles are fickle. We grow them and chiles on the same plant, right next to each other – one will be mild and the other like fire. For us being without chile in the garden, refrigerator or freezer would be unthinkable… like running out of peanut butter. Yikes! 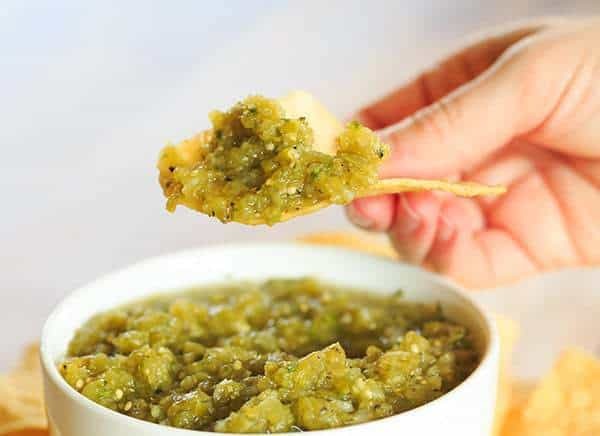 Mmm lovely green tomatillo salsa. And spicy too. I usually use canned tomatillos when I make something like this salsa, but when I I do have fresh ones, I prefer to roast them first. I don’t know, I just feel they taste better that way. My heart was a little bit sad when I saw that the tomatillos were boiled. May I recommend roasting the tomatillos. Line a lipped sheet pan with foil for easy clean up and broil them along with the hatch, flipping half way through. There’s all kinds of goodness that’s concentrated in the final product that you don’t get with boiling (not to mention a better color). Yes! I agree, If you have the opportunity to roast the tomatillos it will add an abundance of flavor to this salsa and more of the nutrients will be preserved. Hi Marla, Thanks for the tip, will definitely roast them next time! This is the second time you’ve used hatch chilis and I’m dying to try them. Do you think you could sneak in a picture of the chili itself? We live in Indiana and sometimes the stores put in a “different” name for the chilis. We love spicy and I’ve pinned your mac and cheese and this is getting pinned too. Thank you for sharing!! 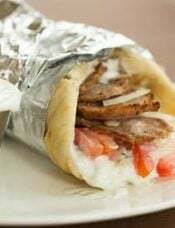 Hi Marisa, Here is a link to a picture I posted on Instagram – it should give you a really good idea of what they look like! Marisa, I’m also in Indiana in the Indianapolis area. To the best of my knowledge, there’s only one upscale grocery here that will have the Hatch chilies. I’ve never seen them at the regular grocery stores. My guess is that unless you live in or near one of the larger cities (especially Ft Wayne and Evansville) you’re not going to see them. I don’t think I’ve seen them this year. You can have them shipped to you. I did a search for hatch chile 2015 and found quite a few places.